Robert Hastings’ acclaimed book, UFOs and Nukes: Extraordinary Encounters at Nuclear Weapons Sites, has been updated and will soon be available in soft cover and e-book format at Amazon.com and Amazon Europe. The reality of UFO incursions at American nuclear weapons facilities has been convincingly established. Hundreds of U.S. military veterans now openly discuss these ominous incidents and thousands of declassified government documents affirm their assertions. Over the past four decades, noted researcher Robert Hastings has interviewed more than 150 of those veterans regarding their involvement in one case or another. On September 27, 2010, CNN live-streamed his UFOs and Nukes press conference in Washington D.C. during which former U.S. Air Force missileers described multiple ICBMs mysteriously malfunctioning moments after a disc-shaped craft was observed hovering near their underground launch silos. These shocking encounters are merely the tip of the proverbial iceberg. Documents and witness testimony confirm UFO activity at nuclear weapons sites as early as January 1945, months prior to the atomic bombings in Japan, and as recently as August 2013, near missile silos in Montana. Further, documents smuggled out of Russia in the early 1990s reveal UFO incursions at Soviet ICBM sites during the Cold War era. Given these disclosures, it becomes clear that the UFO-Nukes Connection is highly significant and perhaps even the key reason these mysterious aerial craft have appeared in our skies over the past seven decades. 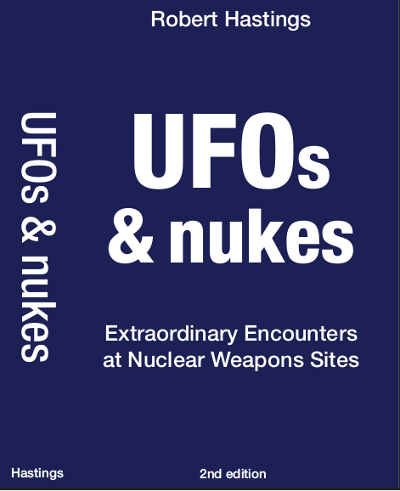 UFOs and Nukes: Extraordinary Encounters at Nuclear Weapons Sites, explores this intriguing, tremendously important saga in intricate, documented detail. (Hastings award-winning documentary film, UFOs and Nukes: The Secret Link Revealed, is currently available at Vimeo On Demand).